ATHENS, THE IDEAL DESTINATION FOR CONFERENCES, INCENTIVES, CONGRESSES, MEETINGS, BUSINESS TRAVEL, INTERNATIONAL CULTURAL AND SPORT EVENTS. Home to 4,500,000 people, Athens is an important political, social, cultural and economic centre in the Balkans and Southeast Europe. Located in east central Greece, Attica, the country's most populated region known as Greater Athens or Attica basin, is surrounded by the mountains of Hymettus in the east, Pendeli and Parnes in the north, the low hills of Mt Aegaleo in the west and the Saronic coastline south-west. Attica comprises the capital, Athens, the adjacent port city and commercial centre of Piraeus, the picturesque Saronic islands of Aegina, Poros, Hydra and Spetses, the wine-producing region of Messogia in the east and a number of smaller towns and municipalities in the west. Travel to and from Athens is very easy. The selection of Athens as the 2004 Olympic assisted in the completion of many infrastructure projects with emphasis on the transportation sector, including the modernisation of road and rail links between Athens and the rest of mainland Greece. The Egnatia Highway, a 680-kilometre four-lane motorway runs from Greece's west coast in the Ionian Sea all the way to the Turkish border in the east, featuring some 85 kilometres of bridges and tunnels. Major infrastructure changes have transformed the city of Athens, including 120 kilometres of new, modern roads, 90 km of upgraded roads, 40 fly-over bridges, 7.7 km new Metro lines, a 23.7 km Tram network, parking lots in central locations with accompanying new management systems, modern train stations and a new, ultra-modern Traffic Management entre, making the city easier to navigate and more enjoyable for even casual tourists. Athens’ new Tram system is modern and clean, impressive and peppy. The futuristic, Italian designed carriages run from the heart of the capital to the coastal suburbs, offering a good inexpensive tour of the seaside, taking to all the public and pay beaches on the capital’s southern coastal zone. 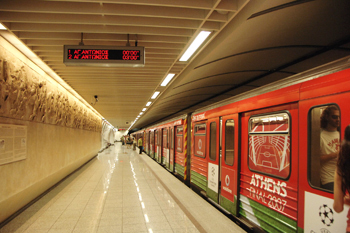 The new Athens state-of-the-art subway system spreads to 21 stations and serves approximately 500,000 commuters daily, with one of its striking features being the underground "station museums" displaying 5th century BC artefacts unearthed during excavations for the project. 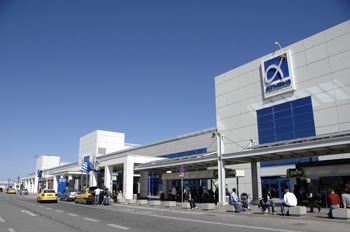 Air travel has been made more appealing with the March 2001 opening of the Athens International Airport. Located just 20kms east of Athens, the new airport features state-of-the-art facilities for the comfort and security of 16 million passengers per year and it is linked with Athens by a recently constructed major freeway. Regular public bus, light rail and cab services give easy access to every part of the capital, facilitated by a number of newly constructed ring-roads, another bequest of the Olympics. Ferry schedules to and from all the Aegean islands are carried out daily from the Attica ports of Piraeus and Rafina. Named after Athena, goddess of wisdom, ancient Athens is considered to be the cradle of Western civilisation. Some scholars date the earliest traces of settlement found on the Acropolis as far back as 5000 BC. The Ionian kings who ruled Athens until c.1000 BC were replaced by an aristocratic regime that governed rigidly until 594 BC. At that time Solon legislated liberal reforms abolishing serfdom, modifying harsh laws, altering the economy and the constitution thus establishing a limited democracy. Building on the system of Solon, in c.506 BC Cleisthenes established a democracy for the freemen of Athens, which was retained during the era of the city's greatness. Emerging victorious from the Persian Wars (500-449 BC), Athens became the strongest Greek city-state, enjoying a cultural explosion that lasted until the peloponnesian War (431-404 BC), which eventually signalled the city's downfall. The rise of the Macedonian power heralded the demise of Athens, which was defeated by Philip II at Chaeronea in 338 BC. Nevertheless, despite troubled times in the Peloponnesian Wars and the wars against the Macedonians, Athenian achievements in philosophy, drama and art continued even when the city's glory faded in the 3rd century BC. The city's cultural legacy conquered the world as Hellenistic culture. During the Byzantine period, Athens became a provincial capital and the centre of religious learning and devotion, to be seized by the Turks in 1546, three years after the fall of Constantinople. One year after the last Turks were driven from the Acropolis in 1833, the small town of Athens became the capital of modern Greece and hosted the first modern Olympic Games in 1896. More recently, Athens was occupied by Italian and German forces during World War II. The organisation of the Athens 2004 Olympics brought some welcome improvements to Athens and the ancient capital has reclaimed much of its former beauty. The city has recently undergone a multi-million-euro "face lift" with building facades painted in fresh colours, ugly billboards removed, sidewalks repaved, new pedestrian precincts made, hundreds of thousands of trees and flowers planted, lighting installed on all historic buildings, parks and squares redeveloped. The city's major ancient sites are linked in a vast pedestrian network, a modern Panathenaic Way closed to all vehicles but public transport, starting at the site of the new Acropolis Museum and eventually reaching the ruins of ancient Eleusis 22 kilometres away. A 1.7 kilometre stretch of tarmac from the Roman Arch of Hadrian to the classical Dipylon Gate, paved in Cycladic marble and stone, is the walkway in the heart of a web extending from the site of the first modern Olympics to the overgrown foundation of Plato's Academy, four kilometres to the west. Walkways link the Temple of Olympian Zeus with the Acropolis, the Philopappos Hill, the ancient and Roman Agoras, Hadrian's Library and Kerameikos cemetery with all six sites spruced up, the ancient structures conserved and restored to a degree. No trip to Athens would be complete without a visit to the sacred rock of the Acropolis, an obvious choice for a fortress and sanctuary in ancient times. Recently undergone extensive restoration, the new Acropolis Museum hopes eventually to display the collection of the 5th century BC Parthenon Marbles currently housed in London's British Museum after they were removed from the Acropolis by Lord Elgin in early 19th century. 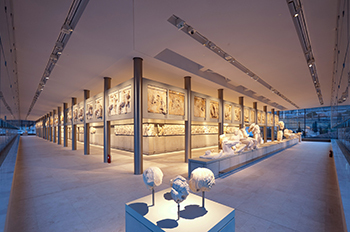 Athens boasts over 50 museums, the most important being the recently renovated National Archaeological Museum that houses more masterpieces of ancient art than any other in the world, with exhibits spanning some 7,000 years. The Benaki Museum, the Byzantine Museum and the National Gallery are well worth a visit. Not far from the capital, there are many attractions in Attica that are ideal destinations for leisurely day trips. 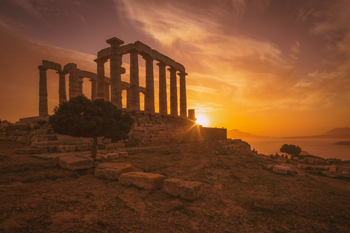 Popular destinations include the 11th-century Kaisariani Monastery, the battleground, tomb and museum at Marathon, the archaeological site of Ramnous and the splendid Temple of Poseidon at Cape Sounion. Gregarious, hospitable and relaxed, Athenians enjoy life to the full. As in any other major city, the visitor will come across people from all walks of life, most of whom are very friendly and willing to offer assistance. Athens is a city of hedonists and consumers who are proud of their capacity to enjoy life. Late at night, people are out all over the city, and this is one of the first things that strikes visitors. The excellent climate allows Athenians to indulge in their favourite pastime - socialising - outdoors nearly all the year round. All over the city there are coffee shops and snack bars ranging from very basic to very chic. Visitors will be surprised and charmed by the energy with which Athenians engage in conversation about politics, football and, perhaps not unsurprisingly, philosophy. In the past two decades sports in Greece went through a major revival with a large number of modern sports facilities constructed in and around the capital. Nevertheless, the city's sports infrastructure has seen great improvements as a result of the 2004 Olympic Games that were hosted in Athens. In addition to the existing plethora of sports facilities, one big sports complex was built for the Olympics 2004, where sports like judo and fencing were hosted. It is located on the site of a former horse racetrack at Faliron Bay and its post-Olympic use is that of a state-of-the-art conference centre. The coastal Aghios Kosmas National Youth Athletic Centre, a 78-hectare area that superbly hosted the 2004 Olympics sailing event, has undergone extensive improvements with upgrades including an expansion of the centres housing up to 204 beds. 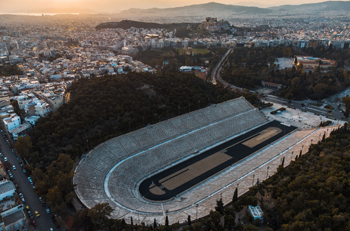 The nearly 20-year-old Athens Olympic Sports complex in the northern Athens suburb of Maroussi, including a 75000-seat Olympic Stadium, has also been upgraded. It hosted the swimming, track and field 2004 Olympic competitions while the complex's 18000-seat stadium hosted the Olympic basketball finals and its velodrom was the venue of the Olympic cycling events. Since the late 80's Greek athletes have been distinguished in many sports, from soccer, basketball, track and field to weight lifting and sailing. For golf aficionados there is an 18-hole golf course at the affluent seaside suburb of Glyfada. The endless list of available sporting and leisure activities includes tennis, gliding, horse-riding, bird-watching, sailing, skin-diving, water-skiing, hiking, bowling. Athenians, like most Greeks, view dining out late in the evening as one of their main forms of entertainment. Literally thousands of traditional tavernas serving delicious, inexpensive food can be found throughout Athens and Attica. In addition, there are hundreds of restaurants, ranging from small, cosy bistros to ultra chic establishments, serving a wide variety of local and international cuisine. And of course there is the ubiquitous Greek souvlaki! 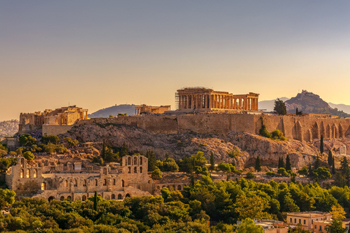 Athens has an impressive variety of goods on offer, from top designer labels and exquisite jewellery to rugs, carpets and high quality leather goods. A large section of the city centre is now for pedestrians only, making shopping a real treat. Ermou has always been one of Athens' busiest shopping streets and is packed with clothing, accessory and quality souvenir stores. Nearby Voukourestiou has some fine jewellery shops and the district of Kolonaki is decidedly chic with boutiques of top Greek fashion designers with successful international careers in Paris, New York and Milan. 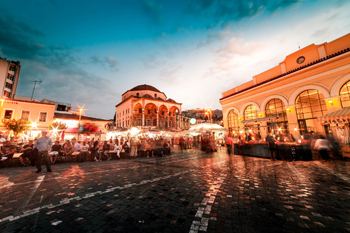 The downtown Monastiraki area encompassing the Flea Market is one of the most fascinating areas in Athens, with scores of tiny shops selling everything imaginable - souvenirs, copper pans, icons, ceramics, old coins, battered furniture, bags and shawls, Turkish swords, folk art, etc. 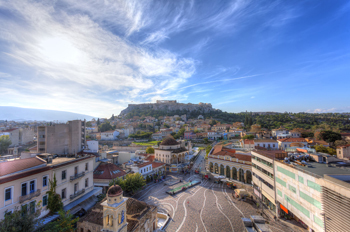 Monastiraki lies next to the Plaka, the old quarters of Athens at the foot of the Acropolis. 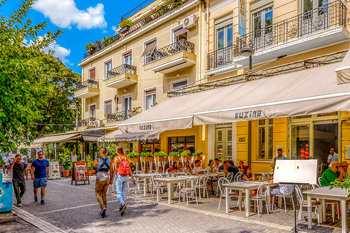 With its winding narrow streets, neo-classical houses, tavernas, souvenir shops and old-world charm, the Plaka is undoubtedly one of the most attractive areas of the city. Cultural events including dance and theatre, recitals, concerts, international trade shows, conferences and symposia, public lectures, gallery exhibits, sports events and marathons are an integral part of life in this bustling cosmopolitan capital. 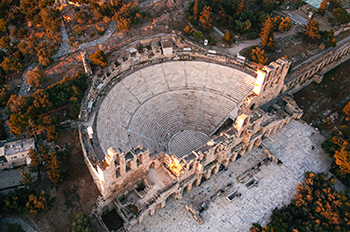 Built in 161 BC, the Odeon of Herod Atticus at the foot of the Acropolis can accommodate up to 5000 spectators, providing one of the most important open-air venues for staging the annual Athens Festival which features music concerts and dance troupes from around the world. Superb performances of ancient and modern drama are staged at the Herod Atticus Theatre. The National Theatre of Greece stages drama performances in modern Greek with English translations provided. 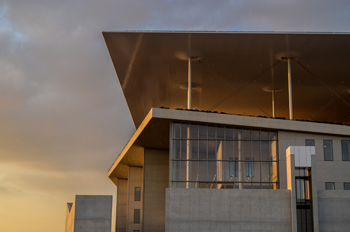 Undoubtedly the pride and joy of the city's cultural life, the Athens Concert Hall (Megaron) comprises a modern theatre, concert and conference hall with spacious reception areas, exhibition space and a 500-seat recital hall. 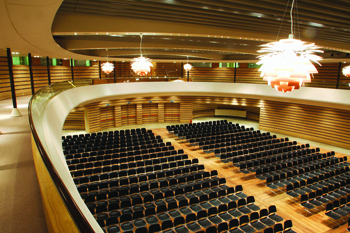 The Megaron Hall is a 2,000-seat auditorium hosting operatic, dance and drama performances almost daily. Perched high on its namesake hill in the centre of the city, the 4,000-seat open-air Lycabettus amphitheatre hosts a variety of concerts by contemporary jazz and pop artists, as well as chamber orchestras, mainly during the summer. The open-air Dora Stratou Theatre on Filopappou Hill provides the venue for traditional Greek dances performed by the internationally acclaimed company from May to September. 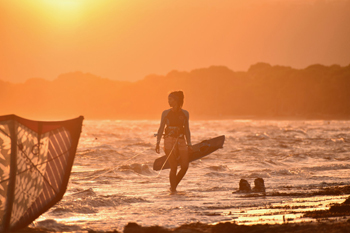 The city's mild climatic conditions and its privileged location offer visitors the pleasures of enjoying both the sea and the nearby mountains. Numerous blue-flag awarded sandy beaches can be easily reached from the centre of Athens by bus, taxi or car. Mt. Hymettus and Mt. Parnes offer excellent walks and hikes. Famous in ancient times for its marble and honey, Mt. Hymettus is also the site of the enchanting 'Koutouki' cave with its marvellous stalactites and stalagmites. Visitors to Mt. Parnes may be fortunate enough to catch a glimpse of wild deer that still roam parts of the pine- and fir-clad mountain. 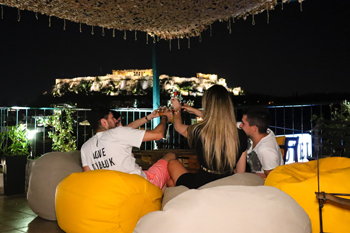 Athens is virtually a paradise for night owls. Whether you start with dinner and then hit the clubs or begin with a couple of drinks before making your way to one of the many live music establishments, the city is sure to keep you entertained until the early hours. The atmosphere in some of the bars and dance clubs has to be seen to be believed, while a visit to a bouzouki club is an experience not to be missed. In summer in particular, it appears that everyone is out on the town. The seaside resorts of Glyfada, Vouliagmeni and Varkiza and the northern suburb of Kifissia are especially popular and provide a cool respite from the city. But choice is not limited to bars and clubs. There are countless coffee shops that stay open until late at night, tavernas, restaurants, theatres and cinemas (both indoor and outdoor). 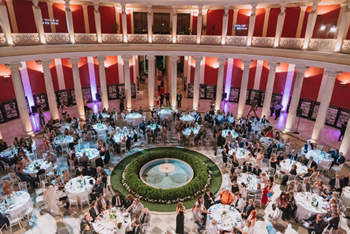 Athens has been the choice of Professional Congress Organisers who have long ago been aware of the advantages involved in holding events in the Greek capital. Advanced infrastructures equipped with the latest technologies for meetings and congresses, air and land transport facilities, a hotel network that is among the best in the world and a climate that is very attractive to congress-goers, are just a few of the factors that have made Athens a success story in the field. The decision of the International Olympic Committee (IOC) to hold the 2004 Olympic Games in Athens energised a nation imbued with the historic memory of the Olympics of ancient times. Millions of visitors to Greece and billions of TV-viewers enjoyed a unique celebration of sports and culture on a more human scale, linking the ancient with the modern, when the Games returned to their birthplace in August 2004. The smashing success of the Olympic and Paralympic Games did not only prove the city’s immense capacity of organising major international events, it also left a legacy behind such as a great number of prestigious conference venues: Due to its amphitheatric shape and amazing acoustics, the Olympic Weighlifting Centre in Nikaia is slated to be used for cultural events and conferences, while the big sports complex built on the site of the former racetrack at Faliron Bay – on the southern coastal zone of Athens – will also be used as a state-of-the-art conference centre. In the Ano Liosia area, in the western suburbs of Athens, the Olympic Wrestling and Judo Center, with a 9,400-seat capacity, is converted into a conference and cultural venue centre. 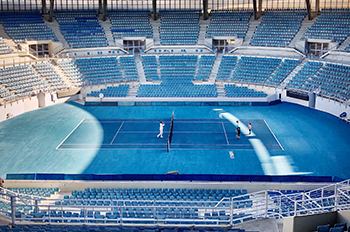 The Olympic Center for Rhythmic Gymnastics and Table Tennis in Galatsi (northeast of the centre of Athens), with 6,000 seat capacity, will be utilized for sports, cultural events, and conferences. In the Municipality of Markopoulo, in eastern Attica, the Olympic Equestrian Center along with the Olympic Shooting Center are slated to operate as reception areas for amateur sports, cultural events, and to serve as conference centres, as well as recreational and tourist areas. Olympic-related renovation fever and major investment also brought great changes in the accommodation sector. Backed by almost half a century of experience in hosting international visitors, as well as the reputation for Greek hospitality, major hotel chains and medium-to-small size units in the Greek capital have undergone extensive upgrades and renovation. Almost all units have obtained a professional makeover, targeting eclectic tourists and above all business travellers and conference organisers. Executive floors, business centres and the concept of ""an office in your hotel room"" have become almost standard features for Athens hotels. Athens is a dynamic city that matches upper-market conference infrastructure with its milestone monuments and glorious history, peaceful and safe atmosphere, strategic geographical position between three continents, gastronomy, markets and nightlife, modern services, traditional hospitality and inspiring working environment due to its climate and natural beauties. It can offer delegates what constitutes a sine qua non in terms of organisation, infrastructure, accommodation, transport and quality, which will certainly surprise and spoil the visitor. Choosing Athens for staging congresses and incentives is a sound investment and an assurance for the success of any event. The photos 1.The Acropolis, 4.The Hellenic Parliament, 7.Plaka were taken by photographer Y.Skoulas and belong to the website www.visitgreece.gr. ERASMUS CONFERENCES, TOURS & TRAVEL S.A.